Creating digital card games is a tough gig, even for giants like Hearthstone. You have to constantly be shifting the goal posts to get people to buy into new sets, balance them, maintain a pro scene if applicable, and keep folks addicted while making money. Often times the prices for building a collection are jacked up, which doesn't bode well for return users in a now crowded market. 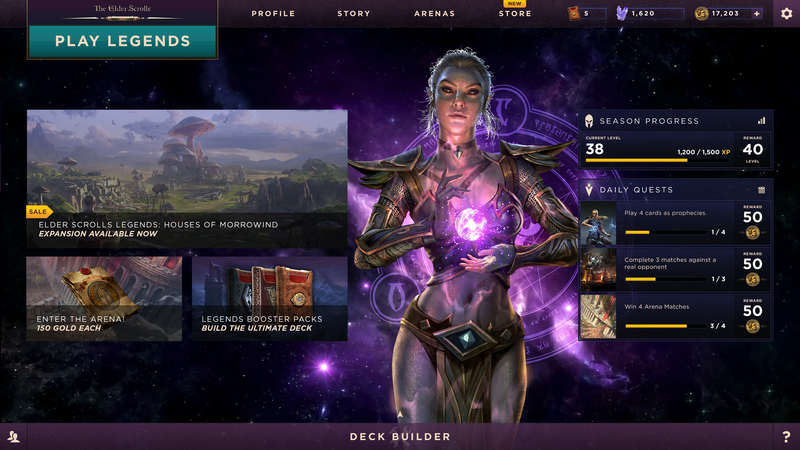 Bethesda is experiencing some of those growing pains actually, as The Elder Scrolls: Legends is changing developers and completely overhauling its systems over a year into its official release on PC. Confirmed to IGN, Dire Wolf Digital, the original studio is out, and now Sparkypants Studios is in. Their first order of business is to create a new UI from the ground up, while the "overall game design" will remain the same. Existing collections will stay, but the direction is being changed to move toward its "untapped potential." Bethesda goes through a considerable amount of effort to not blame Dire Wolf Digital, stating that they "made an excellent game," and once again cite the different direction. Um, let's see where this leads.